This book is PART 2 of a SET of 2 Life Sciences books comprehensively covering the Grade 12 CAPS curriculum implemented in 2014. It contains the 2 Knowledge Areas which are examined in PAPER II of the external National final exam: Life at the Molecular, Cellular and Tissue level, Diversity, Change and Continuity. Both PART 1 and PART 2 Grade 12 study guides offer: Comprehensive NOTES per module, Questions and ‘Rapid fires’ per module and Detailed memos. These 3 in 1 study guides appeal to learners of all abilities and learning styles. They provide clear, up to date notes and bulleted summaries. Clear diagrams enhance the learning experience and boost understanding of challenging topics. Subject material is organised into bite-sized chunks with practical hints provided throughout. The ‘Rapid fire’ questions at the end of each module test and ensure the consolidation of essential terminology. 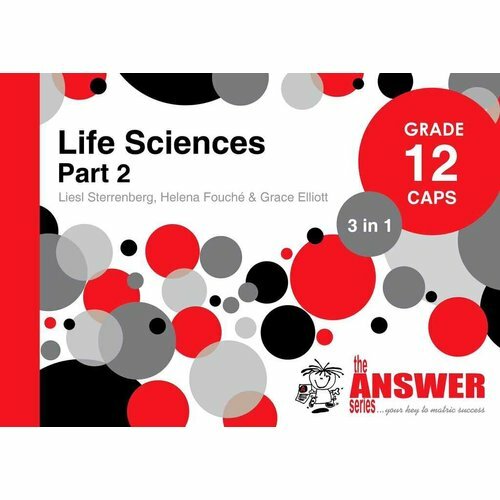 A wide range of questions and answers prepares learners for their final exams. Working through the material systematically, and throughout the year, will enable learners to excel in this subject.